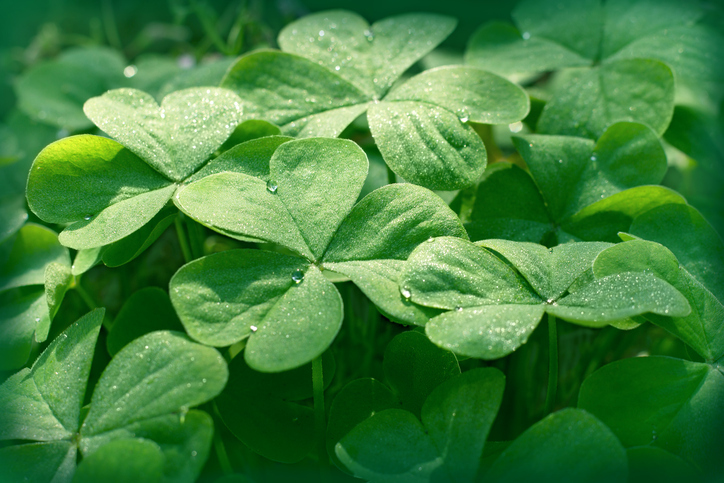 The shamrock is a symbol of Ireland—a green symbol for a green isle. Happy Saint Patrick's Day! Green is, as you know, the color made up of yellow and blue. We also call a plot of grassy land, especially one in the center of a village, a green. Greens, always in the plural, are edible green leaves such as lettuce, cabbage, or spinach. Figuratively, in US English, money can be called green as well, though this is not very common. As an adjective, green refers to anything of the color green, anything covered with leaves, or anything consisting of edible leaves. However, green also means ‘not fully developed,’ when we’re talking about fruit, and, figuratively, it means ‘unexperienced, immature.’ If someone appears sick or ill, we say that they look green. Green also relates to anything that promotes and fights for the environment. There are some very pretty old houses surrounding the green. Eat your greens; they're good for you. I can't afford that; I haven't got the green. Cows were grazing in the green fields. Green vegetables are especially good for you. Those new recruits are still green. I think George had a good night last night; he's looking a bit green this morning though. The government is introducing some new green policies to protect the environment. A green is also the area of smooth grass surrounding each hole on a golf course. Green is, of course, associated with environmentalism because green is the color of so much of the natural world. Concern for the environment is not just a recent thing: in the 630s, Caliph Abu Bakr instructed his troops not to harm or burn down trees, but obviously it has become far more widespread since the Industrial Revolution and, although the word environmentalism itself wasn’t coined until 1922, there were already environmental groups in existence, such as the Coal Smoke Abatement Society, set up in 1898 in Britain. These days, many countries even have a political party known as the green party that is primarily concerned with environmental issues. Green dates back to before the year 900. The Old and Middle English adjective grēne (originally groeni in Anglo Saxon, or groene in Northumbrian dialect) meant ‘green, the color of living plants,’ as well as ‘growing, living or vigorous’ when used in reference to plants. Figuratively, it also meant ‘freshly cut’ or ‘unseasoned,’ especially when talking about wood or plants. It can be traced back to the Proto-Germanic gronja-, and is related to the Old Saxon grani, the Old Frisian grene, the Old Norse grænn, the Danish grøn, the Dutch groen, the Old High German gruoni, and the German grün. Its origin can be found in the Proto-Indo-European root ghre-, which meant ‘to grow,’ so it is also related to the English words grow and grass. The sense ‘covered with grass or foliage’ is from around the year 1200, while ‘unripe or immature’ (fruit or vegetable) dates to the early 14th century. This sense was extended figuratively to describe an immature or young person around the year 1600, though green has been used to describe the color of a sick person since the 13th century. The verb green also dates back to before the year 900, as the Old English grenian (Middle English grenen). It originally meant ‘to become green or flourish;’ the meaning ‘to make green’ dates back to the mid-16th century. The noun comes from the adjective, and dates back to late Old English.